Alto Hotel On Bourke provides our hotel reviews by travellers like you. 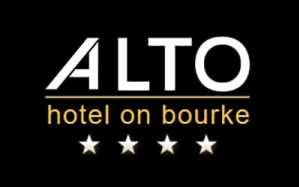 Find out what guests that have stayed with us think about Alto Hotel On Bourke. We provide real guests' opinion about our hotel, written only by our guests. Very courteous and helpful staff. Good location with great eating options close by and transport options right at your door. It was a great hotel and very clean and comfortable. Thanks for catering for my gluten free diet at breakfast. We liked the modern decor, especially the prints in the hallway and in our room. We loved the projected clock on the wall in the dining room, the complimentary hot chocolates (which were better than we expected), the complimentary breakfast, and the pleasant, efficient breakfast staff. In fact all the staff were good. We liked the boutique feel of the hotel. The location was excellent for a Melbourne shopping weekend. We were impressed with how well equipped the room was - even a microwave. The soap, shampoo, and conditioner dispensers were a great way to provide for our needs in a clean, attractive and efficient manner. The bed could have been more comfortable but it was far better than the bed on the Sun Princess. I also really liked the pillows - it's great to provide two different styles of pillow and let the guest choose which one to use (or use both). It was very helpful that we were able to leave our bags with you after we'd checked out (I know this is a common thing but it was still great). Nice and very clean but rooms and bathrooms lack flair. Compared to the lounge area, they seemed very bare and could use better furnishings. 'Blue' compact fluorescents in the bathrooms and bedside gave me a headache. Very friendly staff, in particular with printing boarding passes. Good value and I would probably stay again if I needed to be close to Southern Cross. Loved every minute of our stay. Wouldn't even consider staying elsewhere in Melbourne. Seamless and easy, no problems at all. Words can't express how much we appreciate the Alto Hotel. We have used it for our staff for over 3 years. It is like a hidden jewel in the CBD and permits one to mix business and rest after long flights. We have always been well looked after by the helpful staff. We have enjoyed meals in the restaurant. We typically bus from the airport to Southern Cross station and it is literally a 2 minute walk from the station - so handy. Thanks again for a great stay. Staff were friendly on arrival and the hotel had everything that we needed. The little sitting area by the fire was lovely. My only suggestion would be a few bags of nuts or nibbles in the rooms/minibar. Also, I was on a business trip with two colleagues and there is no option for this under your "Booking Type" selection in this survey. Generally good. Tiny room. Chargin my corporate credit card 3 weeks before I stayed caused me dramas as I had to provide a tax invoice for the monthly statement before I had even stayed. It also meant that because the 'deposit' charged didn't include the 'included' breakfast then I got a separate credit card charge for breakfast and I am not allowed to use the card for food. So bad policy of yours. Great breakfast and LOVED the idea and setup of the reading nook/exchange - very comfortable and inviting. Good solution for parking in the circumstances. Great location, close to bus and train service. Friendly staff, good service and very clean. My experience was absolutely perfect! I was staying their with my family the night before my wedding and when you brought to the room a bottle of champagne and strawberries it made the start to the night beautiful! Thank you so much for helping to make me feel special. I will definately be recommending you to others. It is this kind of service that really makes you stand out from the rest! We are actually planning to stay there in the next couple of months. I look forward to returning with my husband to show him and other family. Thanks again!! Your staff are outstanding! A very good experience. The only disappointment was that the kitchen at the restaurant was closed by 8pm on Friday night. Very impressed with the 100% wind power offset, this would make me consider the Alto again. very enjoyable, staff very helpful and knowledgeable, very clean , mattress was very comfortable but pillows were a bit too soft. mattress was better than the one in the sheraton sydney! Very friendly and welcoming. I appreciated being able to leave my luggage with you before check in and again after checkout. It was lovely to be able to relax on a very rainy day in the lounge whilst waiting for my train. Thank you very much. The most enjoyable and outstanding service we have experienced in the last 40 years of traveling throughout the world. Everything associated with our stay at the Alto Hotel on Bourke Street, was outstanding. The staff went out of their way to make our visit most enjoyable. THANKS FOR THAT OLD WORLD CHARM AND SERVICE. Only there overnight. Clean and tidy and the building had a nice scent to it. Everything was great at Alto save for the near-dead HVAC remote controls and the coldness of the place. I had an enjoyable stay, thank you very much.